Collagen is a protein exclusively found in animals, specifically in the connective tissues and skin of mammals. Collagen is majorly extracted from bovine, porcine, chicken, marine, etc., out of which bovine represents the prominent source of collagen, accounting for nearly 40% of the total collagen market. However, demand for bovine-based collagen is anticipated to decrease during the forecast period owing to the high risk of disease transfer associated with its use, followed by allergic reactions. The global bovine-based collagen for biomedical applications market was valued at approximately US$ 570 Mn in 2016. It is anticipated to register a CAGR of about 10% from 2017 to 2025 to reach a value of nearly US$ 1300 Mn by 2025. Rigorous research and development activities in regenerative medicine and wound healing and increasing commercialization of novel collagen-based drug delivery systems are likely to fuel the expansion of the global bovine-based collagen for biomedical applications market from 2017 to 2025. Collagen helps in skin firming and enables constant renewal of skin cells and is vital for maintenance of skin elasticity. Collagen constitutes the main component of connective tissues and accounts for 25% to 35% of the whole body protein. It accounts for the most abundant protein present in mammals. Skin forms the richest source of collagen, while tendons, cartilages, corneas, blood vessels, and bones, among others, contain an ample amount of collagen. However, risk of disease transmission from bovine collagen sources to humans and undesirable impact or influence of religious or cultural beliefs restrict the growth of the bovine-based collagen for biomedical applications market. There are many unmet needs in global bovine-based collagen for biomedical applications market which create lucrative opportunities for existing players and new entrants globally. Examples of recent developments in the field are the process of preparation of collagenous biomaterials derived from bovine, which is suitable for application in tissue engineering, regeneration, wound healing, and drug discovery by the Council of Scientific and Industrial Research, India in April 2016, bovine-based collagen matrix for soft tissue repair and regeneration by Allosource, the U.S. in September 2016, bovine-based collagen materials for corneal tissue repair and regeneration by Auckland UniServices Limited, New Zealand in November 2016, and collagen scaffold derived from bovine cartilage suitable for treatment of angiogenesis by the University of South Florida in March 2014. The bovine-based collagen for biomedical applications market has been segmented into bone graft substitute, cartilage repair, collagen-based scaffold, hemostat, skin substitute, wound dressing, and others. The bone-graft substitute segment accounted for a dominant share of the market in 2016. It is estimated to gain market share by 2025 and become a highly lucrative segment during the forecast period. Expansion of the segment can be attributed to the increase in preference for collagen as a bone substitute due to its osteoinductive activity. North America (NA) accounted for the largest share of the bovine-based collagen for biomedical applications market in 2016, followed by Europe. NA is anticipated to be a significantly lucrative market for bovine-based collagen products during the forecast period. The market in North America is driven by rise in geriatric population, increase in burn and trauma cases, and growth in demand for bovine-based collagen products as bone substitute, skin substitutes, and cartilage repair. According to the World Bank Group, the geriatric population (65 years or older) in the U.S. was almost eight times more than that in Canada in 2016. Extensive use of bovine collagen in biomedical applications and rise in awareness and affordability among patients for procuring of collagen products are likely to drive the bovine-based collagen market for biomedical applications in North America and Europe during the forecast period. Asia Pacific (APAC) is projected to register a significant CAGR during the forecast period due to increasing preference of bovine-based collagen products, technological advancements, and developing health care infrastructure in the region. Few companies offering bovine-based collagen products for biomedical applications have direct presence in Asia Pacific. Additionally, the market witnesses price variations of bovine-based collagen products in several Asia Pacific countries. For example, prices of these products in Australia and New Zealand is similar to those in the U.S., whereas prices of the bovine based collagen products for biomedical applications is quiet expensive in India as compared to the U.S. and Europe. Key companies operating in the global bovine-based collagen for biomedical applications market and profiled in the report include BBI Solutions, Symatese, Gurnet Point Capital, Viscofan BioEngineering (a part of Naturin Viscofan GmbH), Collagen Solutions LLP, Botiss biomaterials GmbH, Medtronic, Taxus Cardium, KYERON, and Collagen Matrix, Inc.
Collagen is a protein exclusively found in animals, specifically in the connective tissues and skin of mammals. Collagen is primarily extracted from bovine, porcine, chicken, and marine. Bovine represents the major source of collagen, accounting for nearly 40% of the market. However, risk of disease transmission from bovine collagen sources and negative impact or influence of religious or cultural beliefs hamper the growth of the market. The global bovine-based collagen for biomedical applications market report comprises an elaborate executive summary, which includes a snapshot that provides information about various segments of the market. It also provides information and data analysis of the global market with respect to the segments based on application and region. A detailed qualitative analysis of drivers and restraints of the market and opportunities has been provided in the overview section. Additionally, the section comprises competitive matrix and company profiles along with business overview to understand the competitive landscape in the market. This section of the report also provides market attractiveness analysis by geography and market share analysis by key players, thereby presenting a thorough analysis of the overall competitive scenario in the global bovine-based collagen for biomedical applications market. Based on application, the global bovine-based collagen for biomedical applications market has been segmented into bone graft substitutes, cartilage repairs, collagen-based scaffolds, hemostats, skin substitutes, wound dressings, and others. The market has been analyzed based on price variations, technology trend, and presence of key players. The market size and forecast for each of these segments have been provided for the period from 2015 to 2025, along with their respective CAGRs for the forecast period from 2017 to 2025, considering 2016 as the base year. 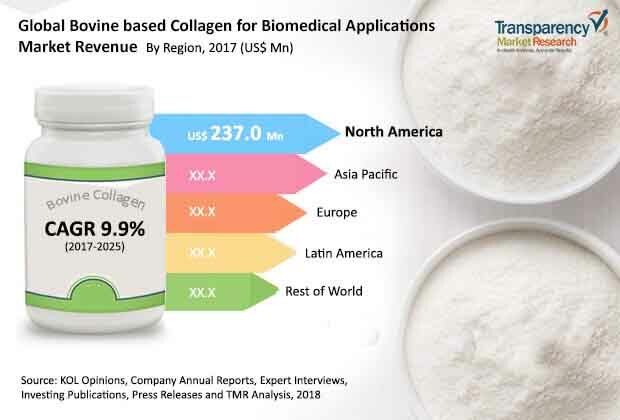 Geographically, the global bovine-based collagen for biomedical applications market has been segmented into five major regions and the key countries in the respective regions: North America (the U.S. and Canada), Europe (the U.K., Germany, France, Spain, Italy, and Rest of Europe), Asia Pacific (China, India, Japan, Australia & New Zealand, and Rest of Asia Pacific), Latin America (Brazil, Mexico, and Rest of Latin America), and Rest of the World (South Africa and GCC Countries). The market size and forecast for each of these regions and the mentioned countries have been provided for the period from 2015 to 2025, along with their respective CAGRs for the forecast period from 2017 to 2025, considering 2016 as the base year. The research study also covers the competitive scenario in these regions. The report also profiles the major players in the market in terms of various attributes such as company overview, financial overview, product portfolio, business strategies, and recent developments. Major companies profiled in the global bovine-based collagen for biomedical applications market are BBI Solutions, Symatese, Gurnet Point Capital, Viscofan BioEngineering (a part of Naturin Viscofan GmbH), and Collagen Solutions LLP, botiss biomaterials GmbH, Medtronic, Taxus Cardium, KYERON, and Collagen Matrix, Inc.